Big Pic Explorer is a repository for the writing and research of Bradley Jarvis concerning the future of humanity. Much of it includes attempts to identify and simply model basic global variables underlying history with the goal of determining what would be required to extend our survival for as long and possible. The site list provides useful links to current and archive pages. Subscribe to the RSS feed for updates to this and related sites. Timelines is the latest and most robust of six models developed over more than a decade. The model includes projections over time for population, consumption (ecological footprint), life expectancy, happiness, age distribution, and economy (Gross World Product, wealth) as totals for the global population and as distributions within the population. Development and testing is continuing through application to historical and current events. A new version simulates populations using random "regions" rather than normal statistical distributions, with most of the same underlying variable relationships as the previous version. 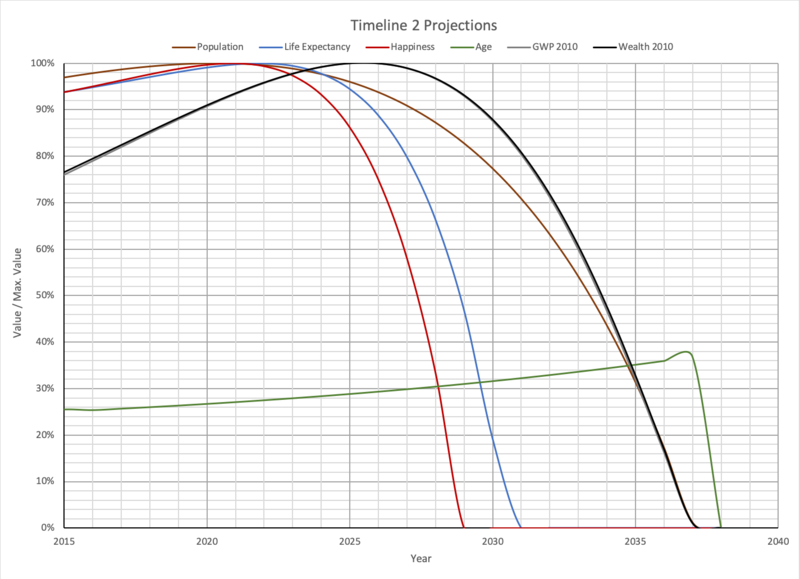 Projected values of variables are based on Timeline 2, the best match of the Timelines model to historical data. Help support my research... buy a book or music today! © Copyright 2011-2019 Bradley Jarvis. All rights reserved.